I’m working on an e-book about the 2018 racing season, with “Racing for the Win” as the working title. You can see a concept title page on the right. The Ironman World Championship in Kona, Hawaii is the highlight of the long-distance racing season. Kona 2017 saw an established female winner in Daniela Ryf, winning her third title after taking control of the race in the last hour on the bike, and a new male winner when Patrick Lange was able to overcome a sizable deficit in the marathon. 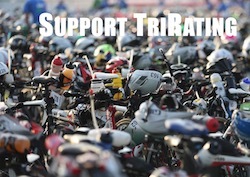 While Kona is the end of the current racing season, it is also the start of the new season. 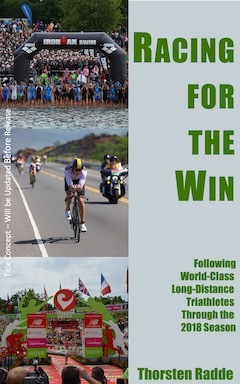 “Racing For The Win” follows some of the world’s best triathletes throughout the 2018 season and in their qualifying races across the globe, building towards fascinating racing on October 13th, 2018 – a day that redefined what’s possible in the hot and humid Kona conditions with new course records in the male and females races. If you’re interested in the book, please leave your email address so I can send you occasional updates on writing the book and all the other little things that are part of a book release.